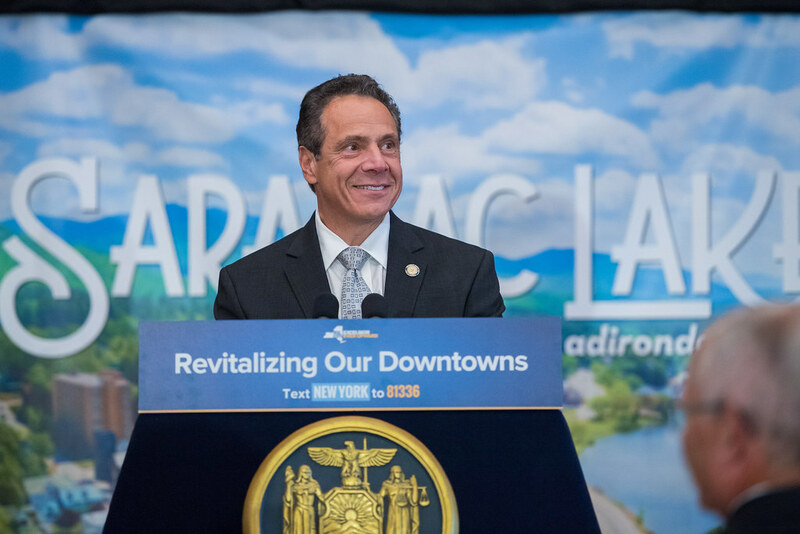 Governor Andrew M. Cuomo today announced that Downtown Saranac Lake will receive $10 million in funding as the North Country winner of the third round of the Downtown Revitalization Initiative. As in the first two rounds of the DRI, one municipality from each of the state's 10 regional economic development regions is selected as a $10 million winner, marking another overall state goal to target $100 million in funding and investments to help communities boost their economies by transforming downtowns into vibrant neighborhoods where the next generation of New Yorkers will want to live, work and raise a family. "Saranac Lake's unique downtown neighborhood and year-round appeal made it an ideal candidate for the third round of Downtown Revitalization Initiative funding," Governor Cuomo said. "Following the re-opening of the landmark Hotel Saranac, we are building on this momentum and helping downtown Saranac Lake reach its full potential, attracting both residents and visitors for generations to come." "The Downtown Revitalization Initiative is providing communities with funding to pursue local projects to enhance their downtowns and spur economic growth," said Lieutenant Governor Kathy Hochul. "This funding for Saranac Lake as part of the DRI will help to revive the historic village and develop new business opportunities, like the re-opening of the Hotel Saranac. The investment in new housing and rehabilitation of existing buildings in Saranac Lake will help to fuel activity and development of the entire North Country region." Downtown Saranac Lake is a historic village in the Adirondacks, surrounded by easily accessible mountains and lakes, attracting tourists from both in and out of state each year. The eclectic, active community serves as a compact hub for surrounding areas, providing a concentration of restaurants, retail, services, as well as cultural and recreational attractions. The $10 million DRI investment will build upon more than $45 million in public and private funds invested in downtown improvement projects over the past 10 years, notably including the re-opening of the historic Hotel Saranac. These projects have already begun to spark new interest in downtown investment and bring about new jobs and business opportunities. To sustain economic vitality, the DRI planning effort will focus on projects that increase the Village's quality of life and year-round public amenities as well as the development of market-rate housing and rehabilitation of existing housing essential to the continued attraction of working professionals and families to Saranac Lake. Saranac Lake's unique downtown neighborhood and year-round appeal made it an ideal candidate for the third round of Downtown Revitalization Initiative funding. Saranac Lake's third round DRI win entitles it to receive $10 million in state funding and investments to revitalize its downtown neighborhoods and generate new opportunities for long-term growth. Saranac Lake now joins the Cities of Plattsburgh and Watertown, which were the North Country region's previous winners in the first and second DRI rounds, respectively. Empire State Development President, CEO & Commissioner Howard Zemsky said, "Strategic investments in the Village of Saranac Lake have paved the way for sustainable economic growth in the heart of the Adirondacks. New York State's $10 million Downtown Revitalization Initiative investment will support small businesses and entrepreneurs, encourage tourism, transform waterfront properties and redevelop Saranac Lake's downtown region." New York Secretary of State Rossana Rosado said, "Downtown Saranac Lake is rightfully being recognized as an Adirondack gem. Governor Cuomo's DRI investment into this community is the latest in a series of providing real resources to the North Country and the entire Adirondack region." New York State Homes and Community Renewal Commissioner RuthAnne Visnauskas said, "Saranac Lake is the latest community to benefit from the Governor's groundbreaking DRI program with an infusion of resources that will make the village and the entire area an even better place to live, work, and visit. Saranac Lake is one of the North Country's greatest assets. Thanks to the Governor's efforts and a strong grassroots strategy, it will continue to grow and offer more housing, recreational, and economic opportunities now and into the future." Senator Betty Little said, "I applaud Governor Cuomo's attention and commitment to the Adirondacks, as we see this important investment in downtown Saranac Lake. The Downtown Revitalization Initiative ensures that communities across the state like Saranac Lake get their fair share of investment to bring about much-needed change to grow the economy and improve our local quality of life." Assemblymember Billy Jones said, "The Downtown Revitalization Initiative is an important part of the state's economic development program, and we are fortunate to see the benefits here in Saranac Lake. On behalf of the residents and businesses in this integral Adirondack community, I am grateful for this investment that will help spur even more growth and sustainability." Anthony G. Collins, Clarkson University President and NCREDC Co-Chair, said, "The Governor's commitment to building the vibrancy of downtown communities is making a difference in the economic outlook for Plattsburgh and Watertown. New infrastructure projects in the Olympic region will bolster tourism and the quality of life throughout the North Country. Through broad public participation and private-public investments, we will continue to use the ingenuity and diligence found within our entire region to make the North Country one of the special places on the planet to live, work, study and visit." Garry Douglas, President of the North Country Chamber of Commerce and NCREDC Co-Chair, said, "Saranac Lake has been a key community receiving strategic investments over the last several years from Governor Cuomo and the North Country REDC. It is now primed to rise to a new level of redevelopment and that is why we are so pleased to be able to target Saranac Lake as this year's North Country DRI winner. Their plan is exciting, building directly on recent progress, and we genuinely look forward to now working with the village and its business community to fully implement all that has been proposed. We also thank Governor Cuomo once again for his extraordinary continuing commitment to this region." Saranac Lake Mayor Clyde Rabideau said, "The downtown revitalization funds will transform the positive energy, hard work and creativity that Saranac Lake is known for into tangible economic opportunity. We are sincerely grateful for Governor Cuomo's vision and his unyielding support of upstate NY and the community of Saranac Lake." Saranac Lake will now begin the process of developing a Strategic Investment Plan to revitalize its downtown with up to $300,000 in planning funds from the $10 million DRI grant. A Local Planning Committee made up of municipal representatives, community leaders, and other stakeholders will lead the effort, supported by a team of private sector experts and state planners. The Strategic Investment Plan for Downtown Saranac Lake will examine local assets and opportunities and identify economic development, transportation, housing, and community projects that align with the community's vision for downtown revitalization and that are poised for implementation. The Downtown Saranac Lake Strategic Investment Plan will guide the investment of DRI grant funds in revitalization projects that will advance the community's vision for its downtown and that can leverage and expand upon the state's $10 million investment. Plans for the DRI's third round will be complete in 2019.